3-Jane Ann Joannah Alice Appleby, the first child of Ellen and William Appleby, was born on 15 Apr 1868 in Exton, Tasmania, died on 19 Jun 1943 in Mole Creek at age 75, and was buried in Jun 1943 in General Cemetery, Mole Creek, Tasmania. Another name for Jane was Alice. Jane married George Lee, son of Oxley Lee and Jane Harold, on 20 Apr 1885 in St. Marks Church of England, Deloraine. 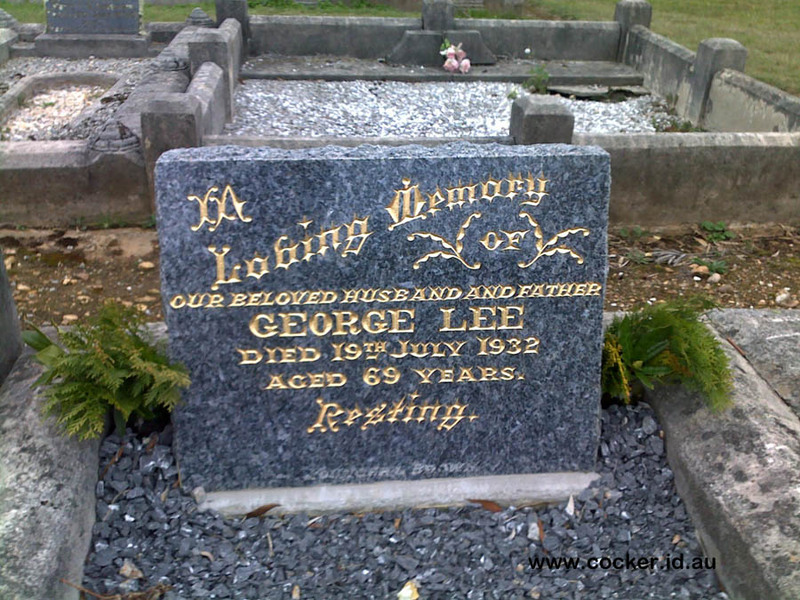 George was born on 6 Nov 1862 in Deloraine, Tasmania, died on 19 Jul 1932 at age 69, and was buried in Jul 1932 in General Cemetery, Mole Creek, Tasmania. Alice attended a private school for girls conducted at Exton by a Miss Woolnough, learning to play the piano while attending school. It is interesting to note that many years later Alice's youngest daughter Millicent married Arthur Wyatt, whose mother Martha Wyatt (nee Coleman) sat with Alice at this school in the 1870's. Alice was just 17 years old when she met and married George Lee according to the rites of the Wesleyan Methodist Church. The service was conducted at Mole Creek by the Reverend William Dykes. In later years they taught Sunday School at this church, Alice playing the organ for church services. George and Alice also gave the church its first coat of paint. The church still stands, but in 1988 is used as a supper room for the present-day church. George was the son of Jane Lee (nee Harrold) and the late Oxley Lee of Mole Creek and worked for Henry Reed on a property which at that time covered most of the area where the township of Mole creek stands today. Alice and George's first home still stands in Mole Creek's main street, in earlier days it had a shop attached to the front and Alice, with the help of her sister Alma, fed the men who worked on the Deloraine to Mole Creek railway. Every working day a sheep was cooked in the large Peters oven. Oliver, Basil, Minette and Eleanor were born while the family was living there. After nine years they managed to save enough money to buy a property known as the "Den Plain", owned by Joseph Turner. At first they lived in a two-roomed hut, built by the previous owner and situated halfway up the hill which rose above the plain, quite unique in that it was placed beside a small cave where food could be kept cool in summer. Edith, their fifth child was born here. George built a small cottage on the Den Plain for the family, where they lived for a couple of years. Oxley was born 1896 in this cottage. Times were hard but Alice and George were determined to have a larger home for themselves and their family and so had to discipline themselves strictly. Alice had only one dress, so she took out the lining and made it into a dress for home and wore the actual dress to church. George only had one pair of trousers for work but his employee Charlie Gilham had two pairs, so on washing day Charlie would lend George a pair of his trousers to wear until George's were washed and pressed. George had had a bad year and after much thought decided that he would have to tell Charlie that he hadn't the money to keep him on, but Charlie's reply was, "We've been through some pretty hard times George, I know you'll pay me when things get better and I'm staying to help". Things did get better and George purchased 100 acres on top of the Den hill which had the added bonus of a large family home. The property had previously belonged to the Flowers family. Alice named her new home "Appleby Place". Six more children, Elsie, Doris, Lewis, Beatrice, Melba and Collonna were born while the family lived here. Mr. Edward James had built a large two-storeyed building in Mole creek main street (on spec), in 1908, which had stood empty for almost two years. George purchased the building and the family moved there in July 1910, naming it "Mountain View House" and operated it as a Guest House. What better venture when one had eight daughters. Just one year and two months after their arrival, their 13th and last child, Millicent, was born. Mountain View House had 32 rooms and could accommodate 100 people. The garden was beautifully laid out by Alice, a small creek running through it with a little bridge to take you over. Alice planted many trees in early times and seats were placed beneath them as they grew larger, the flower gardens were delightful and a small maze was formed by the planting of English box trees which were kept well trimmed. Each Christmas eve, the poorer families were invited to Mountain View's large kitchen where cakes, biscuits, puddings and poultry were laid out in plentiful supply for them to feast their fill. For many it was the only Christmas that they ever knew. Alice was the Registrar of births, deaths and marriages while living at Mountain View House. She also held a special licence to perform wedding ceremonies which she did on three different occasions. George and Alice prospered and as their sons grew older more land was bought to accommodate them. George had been a drover in earlier days working together with Allan Stewart and William Field and had bought land in the Meander Valley where he ran store stock during the summer months, enabling him to grow crops in the Den property. In later years George suffered from dropsy and had leg ulcers which turned gangrenous. He passed away in 1932 and was buried in Mole Creek cemetery. Alice spent her last days at Mountain View House, visiting her relatives and children regularly each year. She was always a lover of the arts and was very keen to see the film "Blossoms in the Dust", attending the theatre at Ulverstone with her sister Flo and her cousin Hildreth Dobson in 1943. Alice however, collapsed before the film began and died instantly. The following are entries Alice had made in her diaries :-"Melba and Trix had been lying on the lounges on the shack verandah reading to Dad and I from Lindsay Gordon's Poems, beautiful pieces, I love the pieces about the horses, they never tire me. Our vegetable garden truly lovely, had raspberries and strawberries and cream today and stewed red currants, peas, beans all out of our garden. This rain today will make things grow. I am thinking it will be a sad Christmas for Uncle Harry this year, Aunt Ida gone. Oxley will be home this week, I will be glad it seems a long time since I saw him, dear boy. Aunt Dobson died 31st August, 1926 aged 74, born at Glenore, married 29th June 1871. Uncle Henry died six years before, was an invalid eight years. Books she liked — Come ye Apart, by J. M. Miller, Still Waters, by C. J. Wright, My Pilot, by G. K. McClean, buried Penguin and she is gone." 4-Oliver Mathew Lee was born on 22 Jun 1886 in Deloraine, Tasmania and died on 6 Sep 1965 at age 79. He served in the First World War. Oliver married Bessie Victoria Howe on 26 Feb 1919 in St John's Church of England, Launceston. Bessie was born on 24 May 1887 to William How and Alice Craig Rawnsley and died on 8 Dec 1978 at age 91. They had two children: Helga Alice Ellenor and William George. 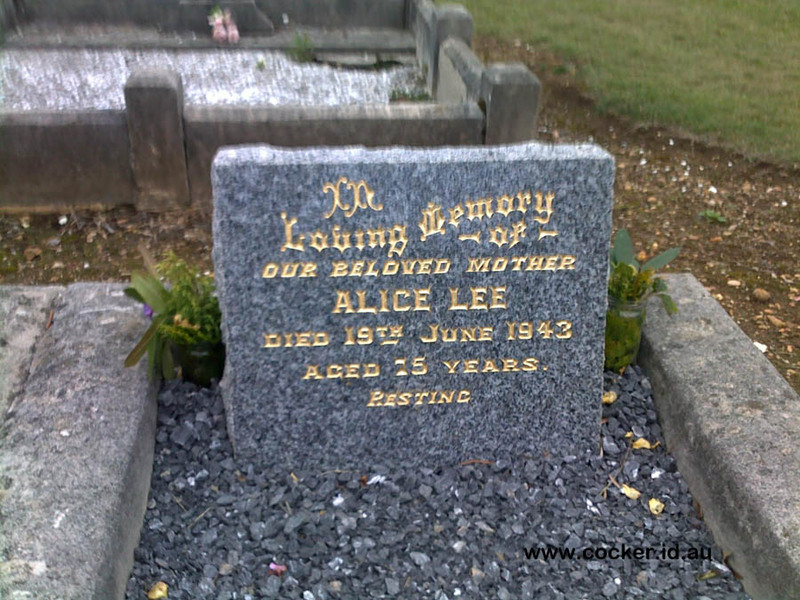 5-Helga Alice Ellenor Lee was born on 24 Mar 1920. Helga married Mervyn James Walker, son of Frank Garfield Walker and Linda Jane Carne. Mervyn was born on 15 Jan 1915 in Longford, Tasmania. They had three children: Anthony Oliver Frank, Lyn Victoria and Viki Helga Mary. 6-Anthony Oliver Frank Walker was born on 6 Jan 1941. Anthony married Laurie Rolls. Laurie was born on 20 Nov 1943. They had three children: David Eden Lee, Leigh Anne and Ian Anthony. 7-David Eden Lee Walker was born on 26 Jun 1961. 7-Leigh Anne Walker was born on 30 Sep 1963. 7-Ian Anthony Walker was born on 1 Apr 1969. Anthony next married Ursula Keltie. 6-Lyn Victoria Walker was born on 8 Jan 1944. Lyn married Kenneth John Rose. Kenneth was born on 10 May 1942. They had two children: Michelle Lee and Maxwell Kenneth. 7-Michelle Lee Rose was born on 28 Mar 1964. 7-Maxwell Kenneth Rose was born on 9 Feb 1968. 6-Viki Helga Mary Walker was born on 3 Oct 1953. Viki married Garry William Kremmer. Garry was born on 18 Nov 1951. They had two children: Daniel John and Timothy. 7-Daniel John Kremmer was born on 20 Mar 1974. 7-Timothy Kremmer was born on 30 Dec 1975. 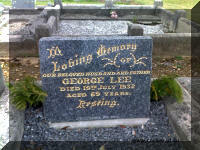 5-William George Lee was born on 17 Aug 1922 and died on 25 Jan 1985 at age 62. He served in the Second World War. William married Nola Mary Alexander. Nola was born on 8 Jul 1921. They had four children: John Alexander Mathew, Susan Mary Helga, Peter George and Marianne Elizabeth. 6-John Alexander Mathew Lee was born on 29 May 1943. John married Carmen Nancy Caruana. Carmen was born on 15 Mar 1948. They had two children: David John and Sharon Anne. 7-David John Lee was born on 16 Jan 1969. 7-Sharon Anne Lee was born on 24 Nov 1972. 6-Susan Mary Helga Lee was born on 21 Jan 1953. Susan married someone. She had two children: Martin John and Caroline Jayne. 7-Martin John Lee was born on 11 Aug 1973. 7-Caroline Jayne Lee was born on 30 Mar 1976. 6-Peter George Lee was born on 24 Dec 1956 and died on 16 Jun 1977 at age 20. Peter married someone. She had one son: Michael Peter. 7-Michael Peter Lee was born on 10 Sep 1975. 6-Marianne Elizabeth Lee was born on 20 Sep 1959. William married Judith Whittaker. Judith was born on 17 May 1952. They had two children: Jennifer Robyn and Kristen Maree. 6-Jennifer Robyn Lee was born on 23 May 1980. 6-Kristen Maree Lee was born on 17 Sep 1981. 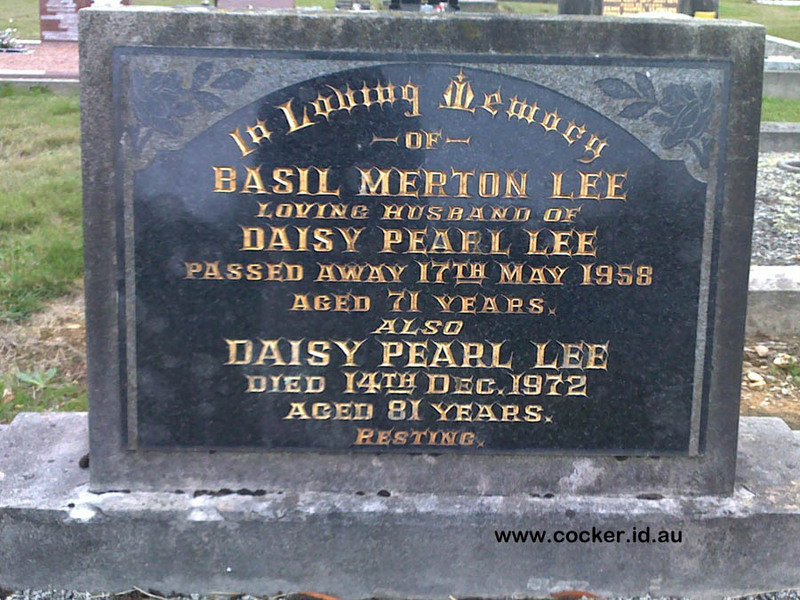 4-Basil Merton Lee was born on 29 Dec 1887 in Deloraine, Tasmania, died on 17 May 1958 at age 70, and was buried in May 1958 in Mole Creek Public Cemetery. Basil married Daisy Pearl Sherriff on 29 Mar 1911 in Chudleigh, Tasmania. 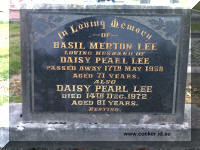 Daisy was born on 21 Jun 1891, died on 17 Dec 1972 at age 81, and was buried in Dec 1972 in Mole Creek Public Cemetery. They had four children: Gordon Merton, Dollie May, Maxwell Raymond and Ronald Hudson Thomas. 5-Gordon Merton Lee was born on 12 Feb 1912 in Chudleigh, Tasmania and died on 26 Aug 1972 at age 60. Gordon married Doreen Wilson. Doreen was born in 1914 and died in 1967 at age 53. They had three children: Geoffrey Lewis, Margaret and Robert Gordon. 6-Geoffrey Lewis Lee was born on 15 Dec 1934. Geoffrey married Jill McLauren. Jill was born on 30 Nov 1939. They had two children: Sally Patricia and Craig Geoffry. 7-Sally Patricia Lee. Sally married Richard O'Brien. Richard was born on 5 May 1962. 7-Craig Geoffry Lee was born on 3 Nov 1962. 6-Robert Gordon Lee was born on 9 Apr 1948. Robert married Shirley Jean Clarke. Shirley was born on 6 Sep 1949. They had two children: Tracey and Jenni. 7-Tracey Lee was born on 4 Mar 1970. 7-Jenni Lee was born on 11 May 1974. 5-Dollie May Lee was born on 26 Apr 1913 in Chudleigh, Tasmania, died on 13 Feb 2001 in Devonport at age 87, and was buried in Feb 2001 in Mole Creek Public Cemetery. Dollie married someone Clement John Cahill, son of John William Cahill and Mary McDermott. Clement was born on 25 May 1910 in Woodbury, Tasmania and died on 13 Dec 1986 at age 76. They had three children: Donald, Annette and Basil John. 6-Donald Cahill was born on 21 Sep 1934. Donald married Elizabeth How. Elizabeth was born on 30 Aug 1937. They had two children: Pauline and Rodny. 7-Pauline Cahill was born on 17 Jul 1960. 7-Rodny Cahill was born on 22 Nov 1961. 6-Annette Cahill was born on 23 Nov 1939 and died on 29 Nov 1939. 6-Basil John Cahill was born on 27 Dec 1943. Basil married Kerrie Louise Rand. Kerrie was born on 1 Jul 1949. They had three children: Kylie Michelle, Roslyn Annette and Anthony John. 7-Kylie Michelle Cahill was born on 29 Oct 1974. 7-Roslyn Annette Cahill was born on 30 Sep 1975. 7-Anthony John Cahill was born on 16 Mar 1979. 5-Maxwell Raymond Lee was born on 28 Sep 1916 in Chudleigh, Tasmania, died in 1997 in Mole Creek, Tasmania at age 81, and was buried in 1997 in Mole Creek Public Cemetery. Maxwell married Vera Mary French, daughter of Leslie James French and Elizabeth Martha Huntington. Vera was born on 15 Oct 1914 in Sheffield, died on 25 Nov 2000 in Latrobe, Tasmania at age 86, and was buried on 29 Nov 2000 in Mole Creek, Tasmania. They had four children: Robert George, David Maxwell, Raymond Lewis and Phillip Leslie. 6-Robert George Lee was born on 24 Dec 1940 and died on 19 Nov 2012 at age 71. Robert married Rosemary Goss. Rosemary was born on 28 Jan 1948. They had four children: Paul Anthony, Jason Maxwell, Georgina Rose and Sarah Jane. 7-Paul Anthony Lee was born on 24 Jun 1970. 7-Jason Maxwell Lee was born on 6 Aug 1972. 7-Georgina Rose Lee was born on 17 Feb 1978. 7-Sarah Jane Lee was born on 8 Jun 1983. 6-David Maxwell Lee was born on 8 Oct 1943. David married Julie Anne Miles. Julie was born on 17 Jul 1947. They had one son: Darren John. 7-Darren John Lee was born on 5 Jul 1964. 6-Raymond Lewis Lee was born on 17 Apr 1946, was christened on 17 Apr 1946, and died on 25 May 2012 in Gold Coast, Queensland, Australia at age 66. Raymond married Maria Fe Fabillar. Maria was born on 14 Dec 1963. They had two children: Benjamin Raymond and Jeremy Michael. 7-Benjamin Raymond Lee was born on 16 Jun 1984. 7-Jeremy Michael Lee was born on 6 Oct 1986. 6-Phillip Leslie Lee was born on 8 Apr 1948. He served in the Vietnam War. Phillip married Carol Maree Rowlands. Carol was born on 2 Dec 1958. They had three children: Anita Jane, Adam Maxwell and Karen Maree. 7-Anita Jane Lee was born on 10 Oct 1976. 7-Adam Maxwell Lee was born on 31 Jul 1978. 7-Karen Maree Lee was born on 31 Jan 1981. 5-Ronald Hudson Thomas Lee. Ronald married Doris Cleary. They had four children: Ronald Hudson Thomas, Merton Lewis, Colona Marie and Carol Anne. 6-Ronald Hudson Thomas Lee was born on 23 May 1946. He served in the Vietnam War. Ronald married Dianne Edith Sykes, daughter of Peter Leslie Raymond Sykes and Majorie Edith Payne. Dianne was born on 10 Nov 1956. They had three children: Travis Ronald, Demelza Deearne and Nathaniel. 7-Travis Ronald Lee was born on 21 Apr 1980. 7-Demelza Deearne Lee was born on 8 Jun 1983. 7-Nathaniel Lee was born on 15 Jun 1986. 6-Merton Lewis Lee was born on 1 Jan 1948. Merton married Elaine Ercig. Elaine was born on 26 Jun 1948. They had one son: Anthony. 7-Anthony Lee was born on 16 Nov 1971. 6-Colona Marie Lee was born on 3 May 1950. Colona married Peter James Gordon. Peter was born on 8 Jun 1947. They had two children: Maree Jane and Andrew James. 7-Maree Jane Gordon was born on 30 Dec 1974. 7-Andrew James Gordon was born on 3 Jun 1977. 6-Carol Anne Lee was born on 1 Jan 1957. Carol married Francis Bernard Galvin. Francis was born on 28 Feb 1945. They had one son: Ben Patrick. 7-Ben Patrick Galvin was born on 28 Aug 1985. 4-Minnie Lee was born on 9 Nov 1889 in Deloraine, Tasmania, died on 4 Apr 1977 at age 87, and was buried in Apr 1977 in Mole Creek Public Cemetery. Minnie married Gloster Richard Richards on 27 Oct 1913 in Launceston. Gloster was born on 21 Nov 1884, died on 2 Jan 1948 at age 63, and was buried in Jan 1948 in Mole Creek Public Cemetery. They had three children: Zoe Cavell, Austin Oliver George and Oxley Lee. 5-Zoe Cavell Richards was born on 1 Sep 1917 in Queen Victoria Maternity Hospital, Launceston, died on 7 May 2006 in Grenoch Home, Deloraine, Tasmania at age 88, and was buried on 11 May 2006 in Deloraine Cemetery. Zoe married Wilton Joseph Ford Sherriff. Wilton was born on 25 Apr 1919 in Deloraine, Tasmania. They had four children: Austin Wilton, Richard John, Rodney Douglas and David Leigh. 6-Austin Wilton Sherriff was born on 19 Sep 1943, died on 14 Apr 1998 in Launceston at age 54, and was buried on 17 Apr 1998 in Carr Villa Cemetery, Launceston, Tasmania. Austin married Valerie Ling. Valerie was born on 28 Aug 1945. They had two children: Deidre Val and Bradley Austins. 7-Deidre Val Sherriff was born on 1 Jan 1968. Deidre married Shane Streets. Shane was born on 1 Aug 1966. 7-Bradley Austins Sherriff was born on 5 Oct 1973. 6-Richard John Sherriff was born on 17 Mar 1945. Richard married Judith Button. Judith was born on 6 Mar 1951. They had two children: Mathew John and Angela Jane. 7-Mathew John Sherriff was born on 29 Dec 1975. 7-Angela Jane Sherriff was born on 1 Jan 1977. 6-Rodney Douglas Sherriff was born on 8 Nov 1946. Rodney married Maureen Joy Catlin. Maureen was born on 14 Dec 1948. They had three children: Janelle Louise, Stephen Rodney and Andrew John. 7-Janelle Louise Sherriff was born on 21 Nov 1972. 7-Stephen Rodney Sherriff was born on 14 Oct 1975. 7-Andrew John Sherriff was born on 8 Dec 1978. 6-David Leigh Sherriff was born on 6 Oct 1956. David married Catherine Linda Powell. Catherine was born on 1 Mar 1960. They had three children: Linda Kate, Simon Joseph and Kristy Lee. 7-Linda Kate Sherriff was born on 4 Jun 1981. 7-Simon Joseph Sherriff was born on 22 Mar 1984. 7-Kristy Lee Sherriff was born on 13 Apr 1985. 5-Austin Oliver George Richards was born on 30 Apr 1919 in Mole Creek and died on 29 Apr 1943 in United Kingdom at age 23. He served in the Second World War. 5-Oxley Lee Richards was born on 20 Jun 1923 and died on 5 Sep 1998 in Mole Creek Public Cemetery at age 75. He served in the Second World War. 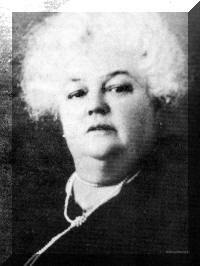 Oxley married Betty Daphne Harrison. Betty was born on 8 Jun 1935. They had three children: Craig Oxley, Timothy Shaun and Trudy Linda Minette. 6-Craig Oxley Richards was born on 18 Jun 1958. 6-Timothy Shaun Richards was born on 6 Oct 1960. 6-Trudy Linda Minette Richards was born on 4 Sep 1962. 4-Eleanor Jane Lee was born on 13 Sep 1892 in Deloraine, Tasmania, died on 2 Nov 1985 at age 93, and was buried in Nov 1985 in Mole Creek Public Cemetery. Eleanor married Frederick Henry James, son of Edward Charles James and Elizabeth S. Killingback, on 11 Sep 1912 in Mole Creek. Frederick was born on 8 Sep 1885 in Franklin, Tasmania, died on 24 Jun 1969 in Mole Creek at age 83, and was buried in Jun 1969 in Mole Creek Public Cemetery. They had four children: Daphne Olivia, Sydney Edward William, Dudley Lee and Geoffrey. 5-Daphne Olivia James was born on 31 Aug 1916 in 96 Queen Street, Hobart, Tasmania. Daphne married Albert Andrew Byard, son of Jabez Ebenezer Byard and Eva Elizabeth Wilson. 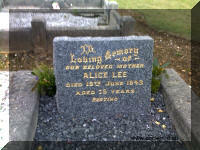 Albert was born on 2 Dec 1912 in Queen Victoria Maternity Hospital, Launceston, died on 10 Aug 2007 at age 94, and was buried on 14 Aug 2007 in Mersey Gardens Crematorium, Devonport. They had five children: Neville, Terrance, Wendy Anne, Andrew Robin and Dimity Sue. 6-Neville Byard was born on 17 Oct 1942 in Launceston. Neville married Kaye Elizabeth Woodhouse on 30 Nov 1963 in Somerset. Kaye was born on 12 Oct 1945 in Burnie, Tasmania. They had three children: Darrel Andrew, Philip Edward and Paul William. 7-Darrel Andrew Byard was born on 19 May 1964 in Devonport. Darrel married Debbie Maree Belbin, daughter of Don Arthur Belbin and Margaret Woomer. Debbie was born on 22 Oct 1963. They had two children: Leigh Damion and Keegan Andrew. 8-Leigh Damion Byard was born on 14 Aug 1984 in Devonport. 8-Keegan Andrew Byard was born on 29 Mar 1992 in Devonport. 8-Rhys Byard was born on 21 Oct 1993. 7-Philip Edward Byard was born on 2 Sep 1965 in Devonport. 7-Paul William Byard was born on 12 Nov 1974 in Devonport. 6-Terrance Byard was born on 20 Feb 1949 in Devonport. Terrance married Susan Marr on 7 Sep 1972 in Hobart, Tasmania. Susan was born on 15 Dec 1948. 6-Wendy Anne Byard was born on 19 Mar 1951 in Devonport. Wendy married Peter Maxwell Keen, son of Max Hilton Keen and Jean Margaret Goss, on 2 Dec 1972 in Devonport. Peter was born on 30 Nov 1950. 6-Andrew Robin Byard was born on 30 Apr 1955. Andrew married Denise Lonsdale about 1975 in Perth, Western Australia. Denise was born on 24 Oct 1957. They had two children: Jacqueline Sue and Michael Andrew. 7-Jacqueline Sue Byard was born on 27 Aug 1977. 7-Michael Andrew Byard was born on 24 Oct 1979. 6-Dimity Sue Byard was born on 28 Jan 1958 in Devonport. Dimity married Peter Russel on 12 Oct 1985 in Devonport. Peter was born on 19 Jun 1956. They had one son: James Michael. 7-James Michael Russel was born on 13 Jan 1988. 5-Sydney Edward William James was born on 20 Apr 1919 in Mole Creek. He served in the Second World War. Sydney married Lois Ruth Tidey in Launceston. Lois was born on 9 Jan 1931. They had two children: Amandah Kay and Tracey Christine. 6-Amandah Kay James was born on 17 Jan 1960. Amandah married Stefan Degac. Stefan was born on 2 Jul 1957. They had one daughter: Katarina Louise. 7-Katarina Louise Degac was born on 1 May 1987. 6-Tracey Christine James was born on 12 Dec 1961. Tracey married Christopher Wayne Brooks. Christopher was born on 9 Sep 1959. 5-Dudley Lee James was born on 21 Feb 1921 in Mole Creek. He served in the Second World War. Dudley married Ella Jean Hutton in Devonport. Ella was born on 29 Oct 1921. They had four children: Maree Jeanette, John Murray, Roseanne Sue and Kerrie Margaret. 6-Maree Jeanette James was born on 5 May 1949. 6-John Murray James was born on 21 Sep 1951. John married Jillian Lesley Barlow. Jillian was born on 17 Nov 1953. They had one son: Zachary Marc. 7-Zachary Marc James was born on 8 Aug 1987. 6-Roseanne Sue James was born on 29 Apr 1955. Roseanne married Charles Campion. Charles was born on 28 Oct 1958. They had two children: Nichole Belinda and Katrina Danielle. 7-Nichole Belinda Campion was born on 21 May 1979. 7-Katrina Danielle Campion was born on 28 Jun 1982. 6-Kerrie Margaret James was born on 29 Aug 1959. Kerrie married Brian John Whitton. Brian was born on 25 Oct 1957. 5-Geoffrey James was born on 6 Jul 1936 in Mole Creek. Geoffrey married Edna Florence Arnold in Deloraine, Tasmania. Edna was born on 15 Feb 1937. They had two children: Penelope Leanne and Tamar Jayne. 6-Penelope Leanne James was born on 13 Jul 1960. Penelope married Owen Clifford Walker. Owen was born on 7 Oct 1957. They had three children: Jasmin Anne, Letita Lea and Minnette Jae. 7-Jasmin Anne Walker was born on 26 Mar 1979. 7-Letita Lea Walker was born on 26 Mar 1979. 7-Minnette Jae Walker was born on 4 Jun 1986. 6-Tamar Jayne James was born on 8 Feb 1967. 4-Edith Lee was born on 30 Jun 1894 in Deloraine, Tasmania, died on 6 Mar 1980 at age 85, and was buried in Mar 1980 in Mole Creek Public Cemetery. 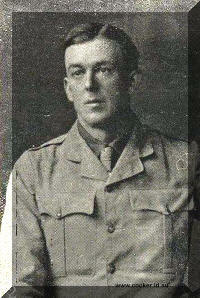 Edith married Osman Urquhart Cameron, son of Peter Cameron and Janet Elphinstone, on 5 Oct 1920 in Deloraine, Tasmania. Osman was born on 21 Sep 1886 in Deloraine, Tasmania, died on 16 Sep 1947 at age 60, and was buried in Sep 1947 in Mole Creek Public Cemetery. Another name for Osman was Urk. They had six children: Urquhart Malcolm Lee (Mac), William George, Monica Nell (Mon), Yvonne Alice, Bruce and Jessica (Jessie). 5-Urquhart Malcolm Lee (Mac) Cameron was born on 24 Apr 1923 and died before 30 May 2004. Another name for Urquhart was Mac. Urquhart married Dawn Christine Plummer. Dawn was born on 14 Sep 1925. They had three children: Carol Trixie, Wayne Urquhart and Patsy Dawn. 6-Carol Trixie Cameron was born on 2 Jul 1947. Carol married Daryl Raymond Fawkner. Daryl was born on 12 Oct 1945. They had two children: Clinton Daryl and Wesley John. 7-Clinton Daryl Fawkner was born on 12 Dec 1967. 7-Wesley John Fawkner was born on 27 May 1970. 6-Wayne Urquhart Cameron was born on 19 Oct 1948. Wayne married Heather Rowe. Heather was born on 28 Aug 1948. They had one daughter: Arlene. 7-Arlene Cameron was born on 14 Mar 1972. 6-Patsy Dawn Cameron was born on 12 Jan 1960. 5-William George Cameron was born on 29 Apr 1924. Another name for William was Bill. He served in the Second World War. William married Maureen Joyce Rabe. Maureen was born on 13 Feb 1931. They had five children: Kim Wiliam, Paul Urquhart, Lee Brian Gordon, Dean Osman and Susie Joy. 6-Kim Wiliam Cameron was born on 16 Aug 1953. Kim married Monica Magel. Monica was born on 30 Nov 1954. They had three children: Vanessa, Emma and Jodee. 7-Vanessa Cameron was born on 28 Oct 1977. 7-Emma Cameron was born on 26 Oct 1979. 7-Jodee Cameron was born on 7 Jan 1981. 6-Paul Urquhart Cameron was born on 8 Oct 1954. Paul married Sharon White. Sharon was born on 6 Aug 1958. They had two children: Levi and Daniel. 7-Levi Cameron was born on 29 Oct 1980. 7-Daniel Cameron was born on 23 Feb 1982. 6-Lee Brian Gordon Cameron was born on 14 Aug 1956. Lee married Jennifer Copeland. Jennifer was born on 14 Mar 1962. 6-Dean Osman Cameron was born on 18 Dec 1957. Dean married Hillary Jones. Hillary was born on 15 Feb 1962. 6-Susie Joy Cameron was born on 3 Jun 1959. Susie married Peter Baskin. Peter was born on 22 Oct 1951. They had two children: Jeanie Joy and Philip. 7-Jeanie Joy Baskin was born on 12 Jul 1982. 7-Philip Baskin was born on 22 Aug 1983. 5-Monica Nell (Mon) Cameron was born on 14 Dec 1925. Another name for Monica is Mon. Monica married Horace George Reid. Horace was born on 25 Mar 1926 and died on 13 Sep 2000 in Launceston, Tasmania at age 74. They had five children: Malcolm George, Laurelle Alice, Lynette Adele, Richard Harold and Lawson Bruce. 6-Malcolm George Reid was born on 5 Dec 1952. Malcolm married Glenda Lorel Cross. Glenda was born on 10 Dec 1959. They had two children: Cameron Bruce and Jennifer June. 7-Cameron Bruce Reid was born on 29 Sep 1981. 7-Jennifer June Reid was born on 22 Dec 1984. 6-Laurelle Alice Reid was born on 12 Jan 1954. Laurelle married Stanley Ronald Wallis. Stanley was born on 22 Jan 1953. 6-Lynette Adele Reid was born on 3 Mar 1956. Lynette married Phillip Macqueen. Phillip was born on 1 Jan 1954. 6-Richard Harold Reid was born on 23 Jun 1958. Richard married Jane Marion Dougall. Jane was born on 9 Jun 1962. 6-Lawson Bruce Reid was born on 21 Mar 1960. Lawson married Llavella Elizabeth Repel. Llavella was born on 3 Aug 1961. They had two children: Danielle Tristen and Levi George. 7-Danielle Tristen Reid was born on 1 Sep 1983. 7-Levi George Reid was born on 9 Nov 1984. 5-Yvonne Alice Cameron was born on 23 Nov 1926 and died on 30 May 2004 in Florida, United States of America at age 77. Yvonne married James John Charles (Jim) Cox. James was born on 12 Jun 1925. Another name for James is Jim. They had one son: John Cameron Milne. 6-John Cameron Milne Cox was born on 14 Jan 1950. 5-Bruce Cameron was born on 31 Aug 1928. Bruce married Betty Gertrude Carter. Betty was born on 21 May 1928. They had one son: Peter Clinton. 6-Peter Clinton Cameron was born on 3 Aug 1966. Peter married Lynne Donahue. Lynne was born on 4 Mar 1966. They had two children: Mathew Peter and Adam Paul. 7-Mathew Peter Cameron was born on 21 Apr 1986. 7-Adam Paul Cameron was born on 7 Jan 1988. 5-Jessica (Jessie) Cameron was born on 31 Oct 1932 and died after 22 Jun 2005. Another name for Jessica was Jessie. Jessica married Sefton Gerald Reid. Sefton was born on 18 Apr 1931, died on 22 Jun 2005 in Eliza Purton Home, Ulverstone, Tasmania at age 74, and was buried in Jun 2005. They had five children: Gennette Fawn, Jessica Anne (Anne), Peter Sefton, Glenda Maree and Julie Susanne. 6-Gennette Fawn Reid was born on 1 Aug 1952. Gennette married Lynley Ramond Bartlett. Lynley was born on 4 Apr 1948. They had two children: Melissa Jane and Skye Julie-Anne. 7-Melissa Jane Bartlett was born on 30 May 1974. 7-Skye Julie-Anne Bartlett was born on 15 Apr 1976. 6-Jessica Anne Reid was born on 7 May 1954. Jessica married Paul Richard Fitzalan Howard Greaves. Paul was born on 14 Feb 1954. 6-Peter Sefton Reid was born on 17 Nov 1956. Peter married Lynne Maree Pilkington. Lynne was born on 26 Sep 1959. 6-Glenda Maree Reid was born on 24 Nov 1957. 6-Julie Susanne Reid was born on 30 Jan 1963. 4-Oxley George Lee was born on 24 Oct 1895 in Chudleigh, Tasmania, died on 1 Jul 1981 in Deloraine, Tasmania at age 85, and was buried in Jul 1981 in Deloraine, Tasmania. Oxley married Esther Mary Byard, daughter of Victor John Byard and Sarah Olivia Lucas. Esther was born on 16 Sep 1912 in Chudleigh, Tasmania and died on 27 Apr 1984 in Tasmania at age 71. They had one son: George Anthony. 5-George Anthony Lee was born on 9 May 1946 in Tasmania. George married Fay Collins. Fay was born on 27 Apr 1947. They had four children: Tracey, Dinah, Brett and Melony. 6-Tracey Lee was born on 2 Jan 1967. 6-Dinah Lee was born on 8 Dec 1968. 6-Brett Lee was born on 8 Aug 1970. Brett married Cindy Cockburn. They had one daughter: Kirrily Ann. 7-Kirrily Ann Lee was born on 6 Feb 2001. 4-Elsie Alice (Tot) Lee was born on 4 Apr 1899 in Chudleigh, Tasmania, died on 18 Nov 1987 in Mole Creek at age 88, and was buried in Nov 1987 in Mole Creek. Elsie married Edgar Frank Byard, son of Victor John Byard and Sarah Olivia Lucas, on 19 Jan 1934 in Perth. 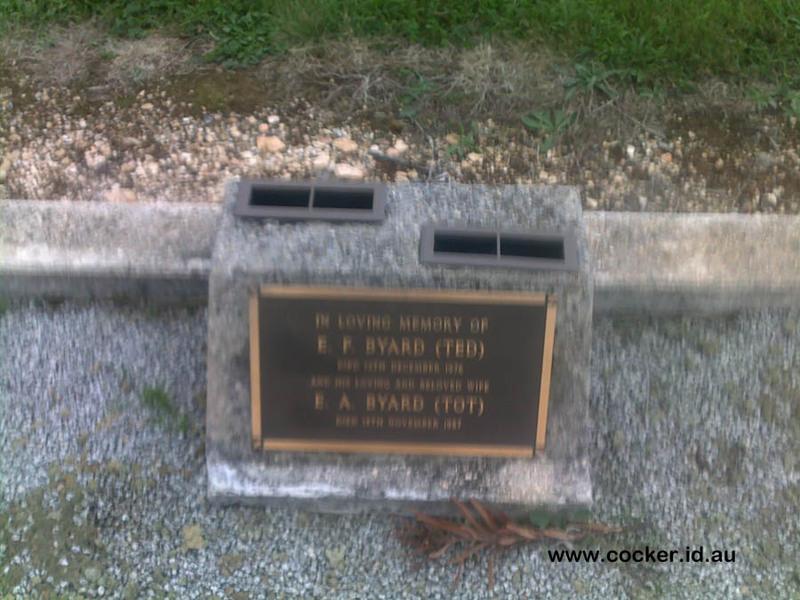 Edgar was born on 20 Nov 1912 in Mole Creek, died on 12 Dec 1976 in Mole Creek at age 64, and was buried in Dec 1976 in Mole Creek. 4-Doris Grace Lee was born on 9 Nov 1900 in Mole Creek and died on 10 Dec 2000 in Devonport at age 100. Doris married Reginald Vero Roydon Cubit, son of James Cubit and Ann Bryan. Reginald was born on 21 Jun 1898 in Caveside, Tasmania, died on 19 Dec 1975 at age 77, and was buried in 1975 in Mersey Vale Lawn Cemetery. They had three children: Jock Alexander, Dorothy and Winstone Churchill. 4-Lewis Lee was born on 30 Mar 1903 in Mole Creek. Lewis married Gladys Richards. Gladys was born on 15 May 1907 and died on 27 Oct 1980 at age 73. They had three children: John Appleby Richard, Rodney Hugh George and Dimpna Alison. 5-John Appleby Richard Lee was born on 27 Nov 1931. John married Brenda Marie Sunderland. Brenda was born on 2 Nov 1939. They had one son: Richard George. 6-Richard George Lee was born on 24 Aug 1970. 5-Rodney Hugh George Lee was born on 11 Mar 1933. He served in the Korean War. Rodney married Ngarie Margaret Cook. Ngarie was born on 26 Jul 1933 in Deloraine, Tasmania. Another name for Ngarie is Narie. They had six children: Trevor Rodney, Michael John, Kevin Shane, Darren Ricky, Allan Scott and Karen Louise Grace. 6-Trevor Rodney Lee was born on 20 Jul 1956. Trevor married Debbie Youd. Debbie was born on 29 Sep 1959. They had three children: Dwayne, Anthony and Trent. 7-Dwayne Lee was born on 14 Jun 1979. 7-Anthony Lee was born on 4 Aug 1980. 7-Trent Lee was born on 27 Jan 1982. 6-Michael John Lee was born on 14 Oct 1957 in Launceston. Michael married Karina Grace. Karina was born on 20 Dec 1963. 6-Kevin Shane Lee was born on 13 Feb 1959 in George Town, Tasmania. Kevin married Linda Reece. Linda was born on 16 Jul 1962. 6-Darren Ricky Lee was born on 14 Jan 1969 in George Town, Tasmania. 6-Allan Scott Lee was born on 21 May 1969 in George Town, Tasmania. 6-Karen Louise Grace Lee was born on 8 Jan 1971 in George Town, Tasmania. 5-Dimpna Alison Lee was born on 17 Aug 1938. 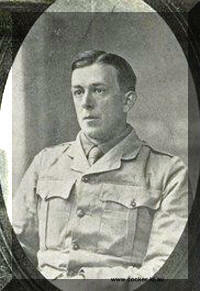 Dimpna married Lloyd Oliver Evans. Lloyd was born on 17 Feb 1929. They had five children: Timothy, Simon Lloyd, Rosealie Jane, Monica Lee and Grant Oliver. 6-Timothy Evans was born on 8 Mar 1959. imothy married Suzanne Ashdown. Suzanne was born in Jan 1962. They had one daughter: Anita Laura. 7-Anita Laura Evans was born on 25 Jan 1983. 6-Simon Lloyd Evans was born on 20 Jan 1961. Simon married Linda Donovan. Linda was born on 8 Mar 1961. Other names for Linda are Linda Jane Donovan, Evans. They had two children: Danielle Alana and Jessica Hope. 7-Danielle Alana Evans was born on 25 May 1987. 7-Jessica Hope Evans was born on 7 Mar 1989. 6-Rosealie Jane Evans was born on 29 Aug 1962. 6-Monica Lee Evans was born on 7 Dec 1967. 6-Grant Oliver Evans was born on 29 Aug 1969. 4-Beatrice Lee was born on 1 Nov 1904 in Mole Creek. Beatrice married John Alexander Macfadyean on 23 Apr 1928 in Launceston. John was born on 5 Dec 1899 and died on 24 May 1970 at age 70. They had three children: Yvonne Estelle, Mary Alice and Nell Helen. 5-Yvonne Estelle Macfadyean was born on 14 Jul 1928 and died on 25 May 1967 at age 38. Yvonne married Allan William Ovenstone. Allan was born about 1926 and died on 29 Mar 1983 aged about 57. They had two children: John Alexander and David Allan. 6-John Alexander Ovenstone was born on 28 Apr 1956. John married Francis Glossop. Francis was born about 1958. They had one son: James Alexander. 7-James Alexander Ovenstone was born on 4 Dec 1986. 6-David Allan Ovenstone was born on 1 Apr 1958. David married Sonia Williams. Sonia was born about 1960. 5-Mary Alice Macfadyean was born on 3 Sep 1934. Mary married Mervyn John Airey. Mervyn was born on 31 Aug 1934. They had four children: Robin John, Timothy Richard, Michael Lee and Craig Mervyn. 6-Robin John Airey was born on 1 Jan 1962. 6-Timothy Richard Airey was born on 17 May 1963. Timothy married Gina Maree Shaw. Gina was born on 21 Sep 1962. They had two children: Nakita Lee and Shannon Maree. 7-Nakita Lee Airey was born on 15 Jun 1986. 7-Shannon Maree Airey was born on 20 Jun 1987. 6-Michael Lee Airey was born on 27 Jun 1967. 6-Craig Mervyn Airey was born on 16 Mar 1969. 5-Nell Helen Macfadyean was born on 31 Jul 1937. 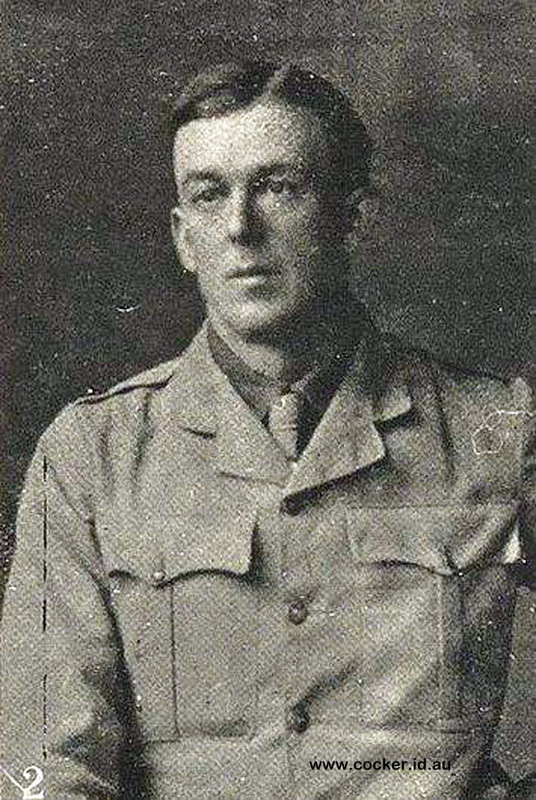 Nell married Gareth Ward. Gareth was born on 1 Sep 1940. They had one son: Damien Llewellyn. 6-Damien Llewellyn Ward was born on 24 Sep 1974. 4-Melba Lee was born on 16 Mar 1907 and died on 17 Mar 1984 at age 77. 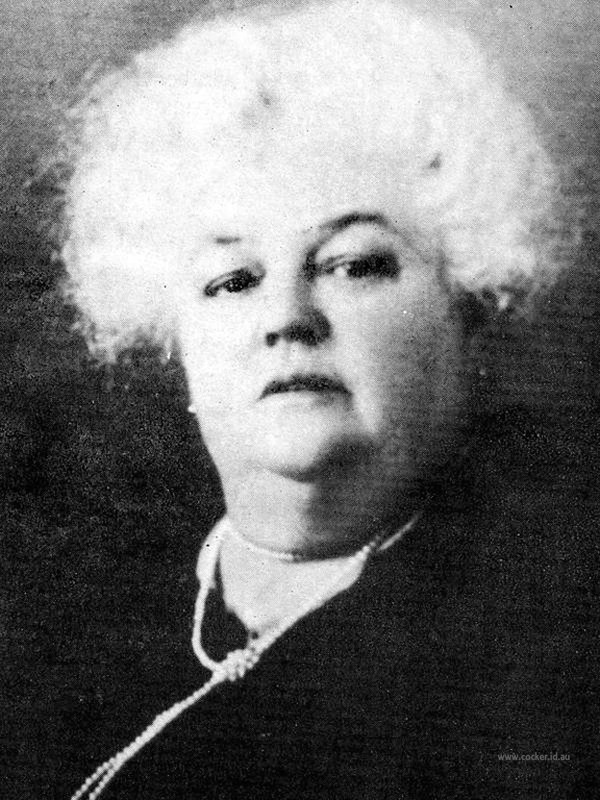 Melba married John Joseph Russell. John was born on 26 Sep 1907. They had two children: Mary and Michael John. 5-Mary Russell was born on 9 Oct 1941. Mary married Jon Robert Strange. Jon was born on 13 Sep 1939. 5-Michael John Russell was born on 20 Apr 1943. Michael married Penelope Jane Riggal. Penelope was born on 20 Nov 1945. They had three children: Timothy John, Rebecca Jane and Benjamin Thomas. 6-Timothy John Russell was born on 24 Apr 1973. 6-Rebecca Jane Russell was born on 21 Mar 1975. 6-Benjamin Thomas Russell was born on 6 Sep 1977. 4-Colonna (Connie ) Lee was born on 26 Jan 1909, died on 3 Jul 1945 at age 36, and was buried in Jul 1945 in Mole Creek Public Cemetery. 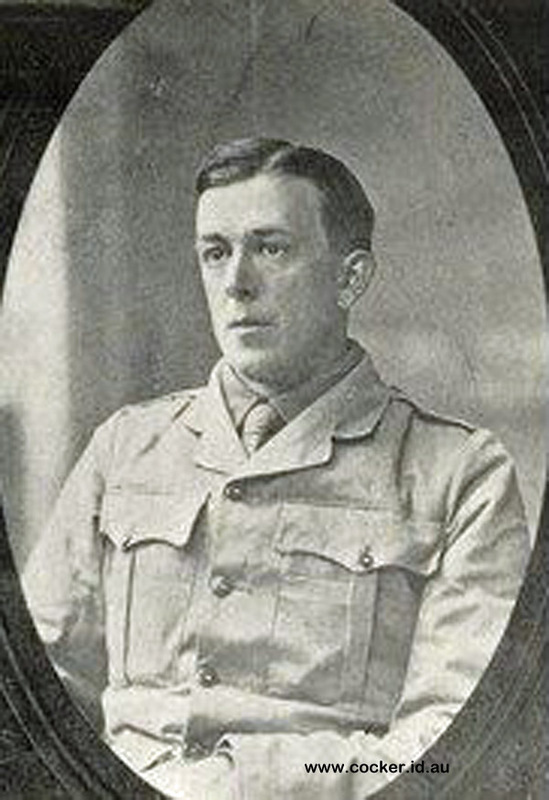 Colonna married Lewis John Raymond (Ray) Sykes. 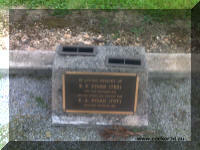 Lewis was born on 28 Jul 1906, died on 21 Nov 1977 at age 71, and was buried in Nov 1977 in Mole Creek Public Cemetery. Another name for Lewis was Ray. They had six children: Peter Leslie Raymond, Neon Lee, William George, Elizabeth Anne, Patricia Millicent and Jennifer Lee. 5-Peter Leslie Raymond Sykes was born on 13 Dec 1929 and died after 18 Oct 2008. Peter married Majorie Edith Payne. Majorie was born on 18 Apr 1932, died on 18 Oct 2008 in Grenoch Home, Deloraine, Tasmania at age 76, and was buried on 23 Oct 2008 in Mole Creek. They had five children: Gaylene Colonna, Philip Andrew, Dianne Edith, Rodney Peter and Cheryl Elizabeth. 6-Gaylene Colonna Sykes was born on 13 Feb 1954. Gaylene married Bruce Charles Gilham. Bruce was born on 3 Oct 1952. They had two children: Corey Bruce and Emma Jayne Lee-Anne. 7-Corey Bruce Gilham was born on 9 Jan 1977. 7-Emma Jayne Lee-Anne Gilham was born on 19 Apr 1981. 6-Philip Andrew Sykes was born on 28 Aug 1955. 6-Dianne Edith Sykes was born on 10 Nov 1956. Dianne married Ronald Hudson Thomas Lee, son of Ronald Hudson Thomas Lee and Doris Cleary. Ronald was born on 23 May 1946. They had three children: Travis Ronald, Demelza Deearne and Nathaniel. He served in the Vietnam War. 6-Rodney Peter Sykes was born on 23 Oct 1958. Rodney married Sue-Ellen Cubit. Sue-Ellen was born on 19 Aug 1961. They had one daughter: Natasha. 7-Natasha Sykes was born on 10 Jul 1986. 6-Cheryl Elizabeth Sykes was born on 26 Aug 1960. Cheryl married Gregory Barnard. Gregory was born on 22 May 1958. They had one daughter: Olivia. 7-Olivia Barnard was born in Apr 1987. 5-Neon Lee Sykes was born on 15 Mar 1931. Neon married Dorothy Joan Greenberg. Dorothy was born on 9 May 1933. They had four children: Garry Raymond, Suzanne Evelyn, David Lee and Jeffrey Leonard. 6-Garry Raymond Sykes was born on 20 Jun 1955. Garry married Diana Welch. Diana was born on 2 Aug 1957. They had two children: Mathew Lee and Andrew Philip. 7-Mathew Lee Sykes was born on 6 Jun 1986. 7-Andrew Philip Sykes was born on 6 Mar 1988. 6-Suzanne Evelyn Sykes was born on 19 Oct 1959. 6-David Lee Sykes was born on 27 Jul 1962. 6-Jeffrey Leonard Sykes was born on 27 Jul 1962. 5-William George Sykes was born on 9 Jun 1933. 5-Elizabeth Anne Sykes was born on 15 Feb 1935. Elizabeth married Ian Herbert Berndt. Ian was born on 10 Sep 1932 and died on 13 Jun 1983 at age 50. They had two children: Stephen John and Timothy Ian. 6-Stephen John Berndt was born on 24 Apr 1964. 6-Timothy Ian Berndt was born on 4 Jul 1967. Elizabeth next married Alexander George. Alexander was born about 1932. 5-Patricia Millicent Sykes was born on 27 Oct 1937. Patricia married Desmond Scott. Desmond was born on 5 Jul 1935 and died on 30 May 1979 at age 43. They had four children: Debbie Lee, Mandy Jane, Vicki Anne and Michael John. 6-Debbie Lee Scott was born on 18 Jul 1957. Debbie married Geoff Turner. Geoff was born on 21 Feb 1953. They had two children: Anita Maree and Graeme Geoffrey. 7-Anita Maree Turner was born on 3 Jan 1973. 7-Graeme Geoffrey Turner was born on 30 Dec 1974. 6-Mandy Jane Scott was born on 5 Jul 1959. Mandy married Michael John Mc Guire. Michael was born on 11 Feb 1956. They had two children: Chemeree Jane and Matt Jon. 7-Chemeree Jane Mc Guire was born on 17 Apr 1986. 7-Matt Jon Mc Guire was born on 18 Apr 1988. 6-Vicki Anne Scott was born on 21 Jan 1962. 6-Michael John Scott was born on 7 Dec 1964. Patricia next married Benjamin Gibson. Benjamin was born on 8 May 1923. 5-Jennifer Lee Sykes was born on 24 Jun 1945, died on 23 Apr 1962 at age 16, and was buried in Apr 1962 in Mole Creek Public Cemetery. 4-Millicent Lee was born on 9 Oct 1911 in Mole Creek and died on 27 Oct 1984 at age 73. Millicent married Carl Elton Sherriff, son of Joseph Sherriff and Catherine Whiteley. Carl was born on 16 Aug 1911 in Deloraine, Tasmania and died on 18 Nov 1984 at age 73. They had two children: Carlyle Lee and John. 5-Carlyle Lee Sherriff was born on 31 Dec 1934 in Deloraine, Tasmania. Carlyle was granted the Order of Australia Medal for services to the Community and the Church of England in 13 Jun 2005. Carlyle married Jennifer Margaret Poke on 14 May 1965 in Hobart, Tasmania. Jennifer was born on 20 Oct 1940 in Hobart, Tasmania. They had three children: Scott John, Anna Jane and Craig Andrew. 6-Scott John Sherriff was born on 19 Apr 1966 in Tasmania. 6-Anna Jane Sherriff was born on 1 Jul 1969 in Tasmania. 6-Craig Andrew Sherriff was born on 1 Nov 1971 in Tasmania. Craig married Jaime Kyne. Jaime was born on 6 May 1979 in Melbourne, Victoria. They had one daughter: Milli Tyler. 7-Milli Tyler Sherriff was born on 30 Sep 2001 in Launceston. 5-John Sherriff was born on 24 Jun 1938 in Deloraine, Tasmania. John married Barbara Duffield on 11 Dec 1965 in Cairns, Queensland. Barbara was born on 5 May 1945. They had three children: Sally Anne, Penelope Jane and Emma Katherine. 6-Sally Anne Sherriff was born on 24 Feb 1970. 6-Penelope Jane Sherriff was born on 4 Sep 1971. 6-Emma Katherine Sherriff was born on 29 Oct 1973. Millicent next married Arthur William Wyatt. Arthur was born on 10 Jan 1900 and died on 22 Dec 1962 in Launceston at age 62.